1st Annual Bitterroot Floating Weed Pull! 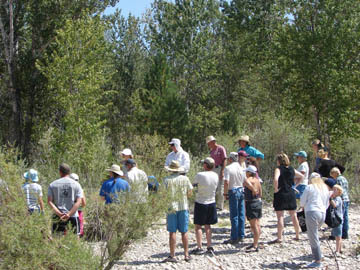 Ravalli County has a fairly new invader known as Viper’s bugloss or blueweed (Echium vulgare), this noxious weed infests the banks of the Bitterroot River and has been moving further up the river each year. The idea for a floating weed pull came after spending countless days on the river inventorying the spread of this new invader, blueweed. 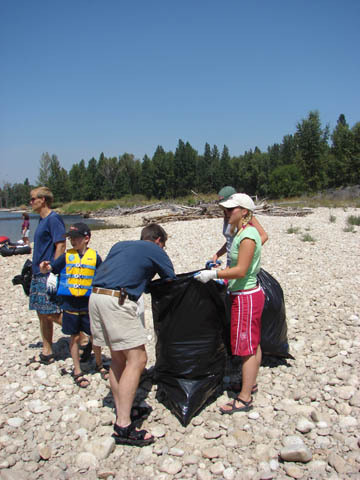 On August 5, 2006 Ravalli County Weed District along with Lee Metcalf National Wildlife Refuge hosted the 1st Annual Bitterroot Floating Weed Pull. 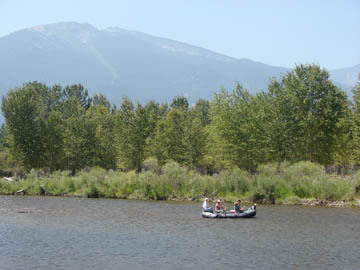 A group of about 40 people in rafts, tubes and canoes floated a 4 mile section of the Bitterroot River near Hamilton, Montana. Participants stopped at 6 sites and received information on: leafy spurge, blueweed, hound’s tongue, yellow flag iris, and bio-controls for knapweed. The floaters got hands on experience releasing Cyphoclenous weevils, the biological control agent for spotted knapweed. Along with learning about noxious weeds participants pulled about fifteen to twenty bags of noxious weeds (mainly blueweed) and picked-up trash. The floating weed pull was concluded with old time country music, a BBQ and a prize drawing in the park. This event was an overwhelming success in our eyes, as well as, in all of the participant’s minds. It was educational, pro-active and most importantly a blast! "Baggin' weeds" along the Bitterroot River in Ravalli Co. Floating along looking for weeds and having a GREAT time!